The service robotics market is estimated to reach USD 23.90 Billion by 2022, at a CAGR of 15.18% between 2016 and 2022. The base year considered for the study is 2015 and the market forecast has been done for the period between 2016 and 2022. The report aims at estimating the market size and future growth potential of the market based on operating environment, application, and region. The report also aims at providing detailed information regarding the major factors influencing the growth of the service robotics market (drivers, restraints, opportunities, and industry-specific challenges) and strategically analyzes micro-markets with respect to the individual growth trends, future prospects, and contributions to the total market. The service robotics’ ecosystem includes research and development associations, component manufacturers and suppliers (such as for sensors, actuators, power source, controller, and others), software development, prototype development and testing, assembly, distribution, marketing strategies, installation, and aftersales services. The service robotics marketspace comprises major players such as Northrop Grumman Corporation (U.S.), KUKA AG (Germany), iRobot Corporation (U.S.), Kongsberg Maritime AS (Norway), DJI (China), Intuitive Surgical, Inc. (U.S.), Parrot SA (France), GeckoSystems Intl. Corp. (U.S.), Honda Motor Co. Ltd. (Japan), Adept Technology, Inc. (U.S.), Bluefin Robotics- now wholly owned subsidiary of General Dynamics Mission Systems, Inc. (U.S.), ECA Group (France), Aethon Inc. (U.S.), DeLaval International AB (Sweden), and Lely Holding S.a.r.l. (Netherlands). The global service robotics market is expected to reach USD 23.90 Billion by 2022, at a CAGR of 15.18% between 2016 and 2022. The market is expected to grow substantially owing to factors such as high demand from medical and healthcare sector, increasing usage of robots for education & research purposes and short- to medium-term payback period and high return on investment (ROI). The service robotics market has been segmented on the basis of operating environment into aerial, ground, and marine. The aerial market has been further classified into military, and civil and commercial applications. 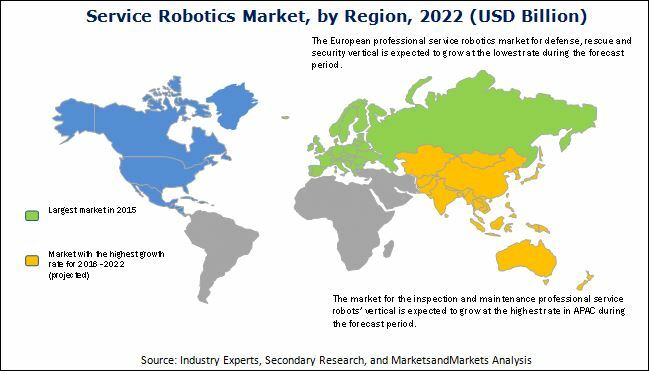 The ground service robotics market has been segmented into defense, rescue and security, field robotics, medical, logistics, telepresence, inspection and maintenance, domestic tasks, education and entertainment, and personal assistance and home security. Autonomous underwater vehicles (AUVs), remotely operated vehicles (ROVs), and unmanned surface vehicles are different types of marine service robots. Among the overall service robotics market, the market for ground-based service robots is expected to grow at a higher rate because of the strong demand from logistics applications, especially for automated guided vehicles (AGVs) and other service robots for automating the transportation services across this end-user application vertical. The market for the professional service robots is expected to grow at the highest rate by 2022. Many end users in the professional application segment have already adopted usage of service robots across essential business operations. Emergence of other professional service applications such as telepresence, and inspection and maintenance are further estimated to add to the growth of professional sector of service robots’ deployment. Such trend is more prominent among developed countries across European region, which, in turn, is estimated to hold the largest market share during the forecast period. However, Asia-Pacific is expected to grow at the highest rate owing to the strong demand for professional service robots across China and India. In 2015, Europe led the service robotics market, followed by North America and Asia-Pacific. The U.K held the largest share of the European service robotics market, followed by Germany and France. However, the service robotics market faces some challenges associated with safety issues while working alongside humans and take longer time to commercialize in the market. The high initial costs and R&D expenses, along with performance-related issues in untested environment, and lack of high level interfacing acts as some of the restraints of the market growth. This report describes drivers, restraints, opportunities, and challenges pertaining to the market. Furthermore, it analyzes the current scenario and forecasts the market till 2022, including the market segmentation based on operating environment, application, and region. Some of the major companies in the service robotics market include Northrop Grumman Corporation (U.S.), KUKA AG (Germany), iRobot Corporation (U.S.), Kongsberg Maritime AS (Norway), DJI (China), Intuitive Surgical, Inc. (U.S.), Parrot SA (France), GeckoSystems Intl. Corp. (U.S.), Honda Motor Co. Ltd. (Japan), Adept Technology, Inc. (U.S.), Bluefin Robotics- now wholly owned subsidiary of General Dynamics Mission Systems, Inc. (U.S.), ECA Group (France), Aethon Inc. (U.S.), DeLaval International AB (Sweden), and Lely Holding S.a.r.l. (Netherlands).